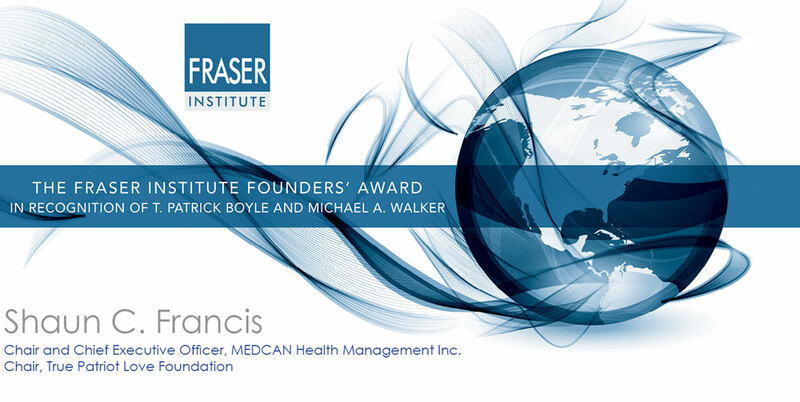 Please join the Fraser Institute in celebrating Mr. Francis’ contributions to Toronto and Canadian businesses. In previous years, Torontonians have been very generous with their support which has been instrumental in ensuring each honouree is celebrated in a manner fitting of their contribution. We hope that this year you will help us continue that tradition. Shaun Francis is the Chair and Chief Executive Officer of MEDCAN Health Management Inc. one of the world’s largest providers of preventive healthcare with over 50,000 clients. Among many of Shaun’s accomplishments is his dedication to the Canadian military. In 2009, Shaun founded the True Patriot Love Foundation which has raised over 18 million in support of military families and community-based programs across Canada. Shaun also chaired the bid committee for the Invictus Games Canada and served on its board. In 2010, Canada’s Chief of Defence Staff, General Walter Natynczyk, awarded Shaun the military’s highest recognition for a civilian, the Canadian Forces Medallion for Distinguished Service. In 2011, Shaun was the convocation speaker at the Royal Military College in Kingston, Ontario where he received his Honorary Doctor of Laws from Canada’s Minister of National Defence, Peter MacKay.